Jan's specialties include building and rebuilding Ultra Lightweight Hunting Rifles, Sheep Rifles, Rimfire Rifle improvements and modifications, designing and machining rebuilds, and conversions (caliber, single shot to repeater, rim to centrefire). He performs Blue-Printing (Trueing) of Actions, Action Slabbing (lightening), Barrel Fluting, Re-barreling, as well as work on Shotguns. Jan further designs and produces his own H.E. Viper and Slim-Line Muzzle Brakes. Call Jan at +1 (250) 919 8529 or 426 3829 (Mountain Time). When done reading, scroll back up and click Click to Close (above) to close this Specialty and view the next. I have many other specialties, such as .22 Rimfires, Air-guns and Shotguns. However, my main-stay of the business are Leight Weight Fiberglass-stocked Sheep Rifles. 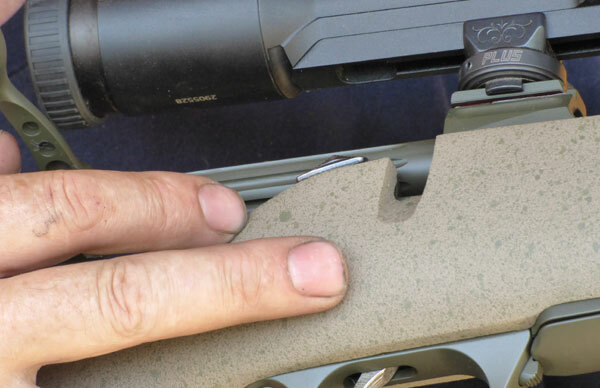 By combining top quality workmanship with only the lightest and best quality materials and parts available, the results are highly accurate lightweight Sheep Rifles, that are fully capable of top accuracy past the 600 yards mark. There are just too many variations to mention, so it can all be discussed and built to the customers wishes and specifications. My custom-build Sheep Rifles are used by hunters all over the world. Contact me I'd love to discuss your needs and deliver the results you're striving for. 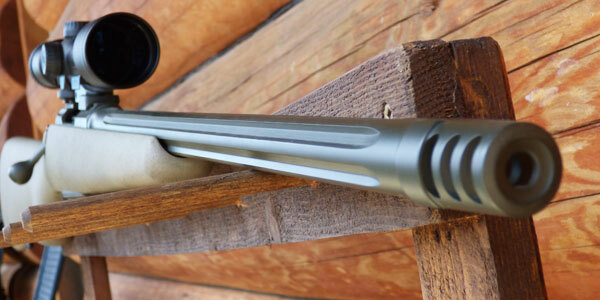 Custom Remington 700 — .280 AI. Barrel #3, s/s-match KS, 26", Acme-fluted in 1:8.5 twist with a PAM 'Ti-shorty' brake fitted. Stock: Bansner Sheephunter. Weight: 5.85 Lbs with steel scope mounting hardware included (wo scope). Action/Bolt accurized, slabbed, custom PTG Bolt-knob fitted, skeletonized bolt-handle and the bolt-body has been diamond-fluted! Stock was finished in Grey/Tan camo, all metal work Titanium Dura-Coat! Custom Tikka-T3 — 7mmRSAUM. Barrel: 24" FW-Krieger, CrMb2 in 1:8.5 twist! Mzl-brake: PAM-'Ti. shorty.' Stock: Wildcat-Carbon/Fibre Weight: 5.45Lbs (wo scope). The action/bolt accurized and modified! Action and Mag. box are the only original parts left; the rest is after-market with metal parts made of either lw-Aluminum and Titanium! And Cerakoated in Tan-Desert camo! Commonly also referred to as 'accurizing' or 'trueing.' 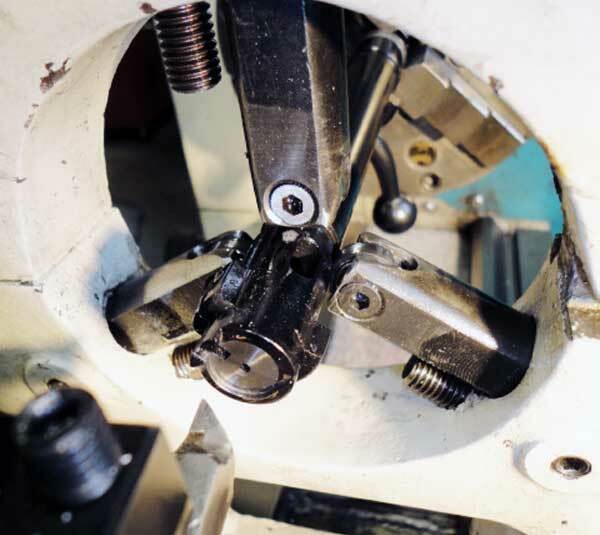 Despite what most in this trade would like the consumers to think: this is not just a simple machining-procedure to be undertaken by the average DIY'er or those with just a basic set of machining skills/experience. 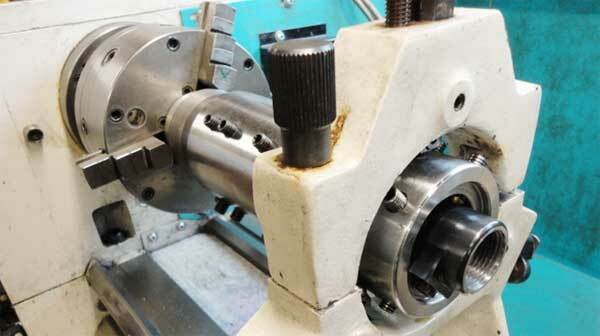 On the contrary: It is a set of multiple machining-procedures for the advanced machinists among us. Undertaken for the sole purpose of machining everything in-line and at a perfect 90 degree angles with the actions center bolt-raceway line. A very time consuming affair of a combination of precision set-ups, precision tooling/jigs/fixtures and precision machining-skills. Action/Bolt Blue-Printing is an absolute must in order to built any benchrest-grade precision rifle. Especially so if it is going to be used for long-range target shooting, competition shooting, or long-range hunting past the 600 yards line. The significance of Action/Bolt Blue-Printing only became public knowledge in the late 80's/early 90's, when long-range shooting first became really popular due to the introduction of improved new CNC-Machine technologies which were able to produce much better and more accurate machines, tooling and molds for the production of precision long-range bullets/projectiles. 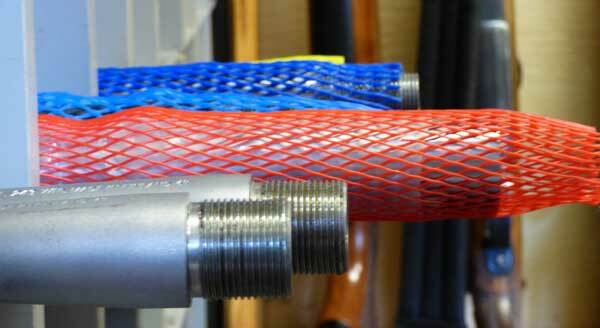 Action/Bolt Blue-Printing is nowadays offered by a good number of reputable gunsmiths/gunmakers/machinists. The art is reserved for those that have not only undergone the appropriate quality gunsmithing training, but also have mastered themselves an advanced level of machining/gunmaking-skills, metallurgic knowledge, and access to proper quality machines and tooling. I simply don't want to go into the full details as such, since there are just too many variables that involves the type of action, 'brand,' year of manufacture, age and even the quality of steel 'properties' used for the particular action. Furthermore: Everyone has his own 'favorite' tooling, his own methods or even his own 'trade-secrets' in order to get the ultimate precision out of his clients' rifles, or even his own. PS. A word of caution: considering the extend of the actual labour involved and the resulting cost for this type of action/bolt rework, it is very important for customers to do the research before committing themselves. Be aware of the gunsmiths, gunmakers, machinists level of trade-training/skills and overall trade experiences, before giving them the go-ahead! Simple fact is that North America in general and particularly Canada is lacking any form of proper Federal Gunmaking Apprentice Training Programmes or Schooling, as is still commonly seen in a few Western European countries. For this the local industry is broadly un-regulated and unprotected. Basically an open market free to enter for anyone with a firearms-license and who can equip themselves with some basic engineering skills. Needless to say this market is literally flooded with so-called DIY's! Take it from me or for that matter any gunmaker/gunsmith worth his salt: there is just no way that someone can do all this work for under the $350 mark! One simply can't buy a classic and sound body Porsche 911 for $500 either can you? So please do remember: "If the quote on this type of rework sounds too cheap, then it just isn't what it is supposed to be!" 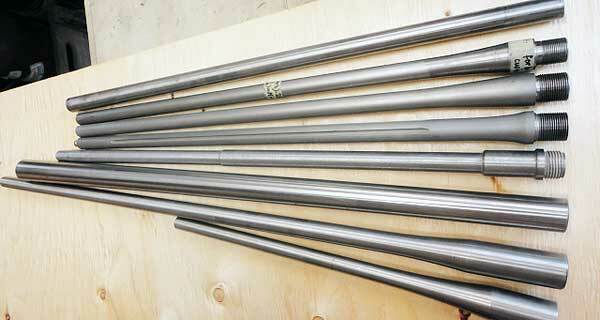 By combining top quality custom barrels from renown barrel-makers, custom designed tight-spec reamers with the best tooling money can buy, and a quality toolmakers lathe, we reach the full potential of an already 'accurized' action and a properly fitted custom barrel: Delivering the very best in accuracy! We all have our own opinion on them and know they have their 'pro's and con's'. Yes, they can be loud and there is just no such thing as a Quiet Brake, as some manufacturers like to claim. However the 'pro's' far outweigh the 'con's' in my humble opinion. Due to the substantial recoil-reduction, muzzle-brakes achieve greater overall accuracy, and avoid developing the dreaded 'flinch.' Depending on the calibers-size and load, in most cases, with a properly manufactured muzzle-brake, one can actually see the hit. In a lot of cases muzzle-brakes will also totally confuse the game as from where the shot is coming from! And this, depending on the distance, can effectively give you time for a second or even a third shot in case you missed! Different models are available and I even offer the 'integral' type that is part of your new barrel! 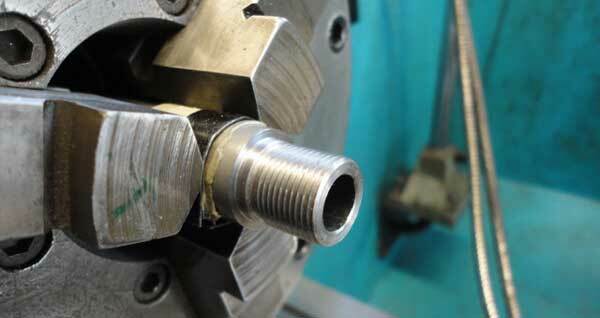 All are made and precision fitted right here 'in-house.' I only use the best steels available for these brakes which can actually offer up to 45% recoil-reduction! My personal 'favorite is my latest design: the "HE-Viper" Brake (see top right image). It is the angled 'side-venting' type of brake that offers the same reduction as the 360 degree venting one, but can be shot from the 'prone' position, without disturbing any soil and giving away the shooter's position! 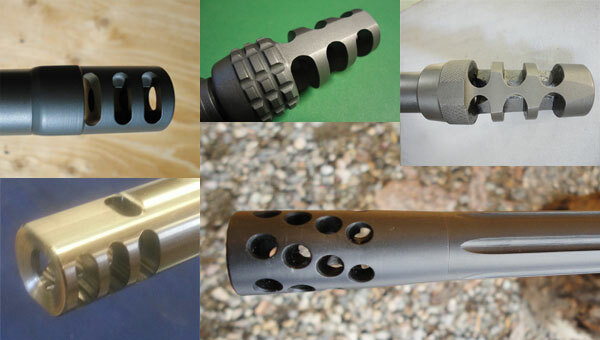 It can also be machined with top-venting, depending on the caliber and rifle stock being used. An absolute must for the serious Sheep Hunters among us that want the ultimate in lightweight in their custom built Sheep Rifles. A slight increase in overall accuracy, if done the right way. 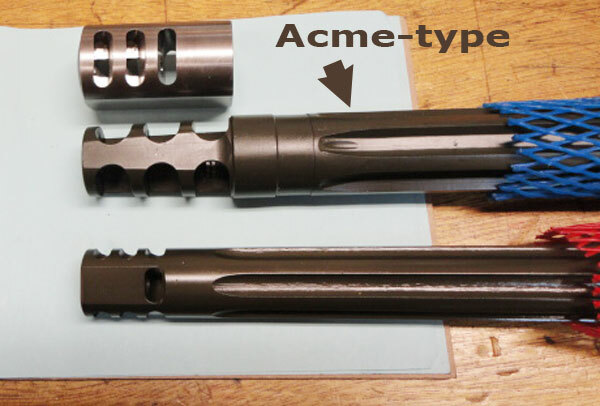 Most of my own hunting rifles are fitted with fluted barrels and my personal favorite is the new Acme-type fluting, which I've introduced recently and offers the ultimate weight-saving, stiffness and speed of cooling-off! To the right (top) you see the two main types of barrel fluting used, including my new Acme-type fluting. Both have been finished off with an Cera-/Armour-coat type finish.